October is National Bullying Prevention Month, a nationwide campaign founded in 2006 by PACER’s National Bullying Prevention Center. Each year, we like to offer you practical insights and strategies to help support your school’s anti-bullying initiatives–in October and beyond. 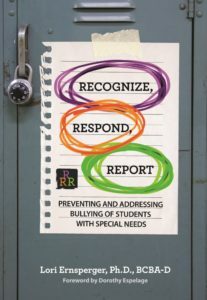 Today, we bring you nine key strategies for bullying prevention, excerpted and adapted from the book Recognize, Respond, Report by Lori Ernsperger. The book focuses on preventing and addressing bullying of students with disabilities, but these strategies can help reduce bullying for all students in an inclusive school and create a learning environment where every child is respected. Bullying and harassment interventions are important, but your overarching goal is to establish a positive school climate where all students, staff, and parents are treated equitably and with respect. What does this kind of school climate look like? 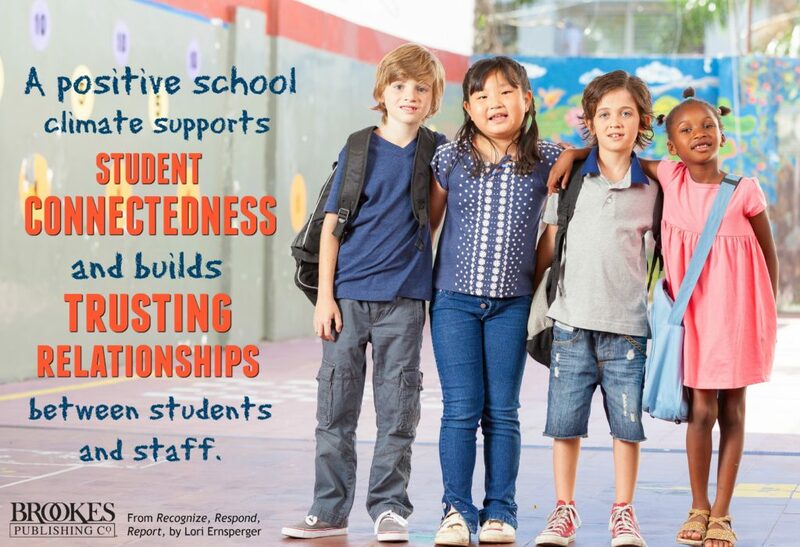 A positive climate is one that supports student connectedness and safety, engages every learner, and builds trusting relationships between students and staff. Another way to help establish a positive school climate is to adopt a social-emotional learning (SEL) program and embed it into your existing curriculum. Adopting a proven SEL program can help you address the root causes of student conflict and teach the skills students need to avoid bullying behaviors. Actively involve students and give them a strong voice in all aspects of developing a bullying and harassment prevention program. Write and disseminate clear policies and protocols that emphasize prevention, positive school climate, and evidence-based interventions. Adopt measurable steps for reporting, investigating, and responding to incidents of bullying. Create bullying prevention activities to implement throughout the school year. Distribute sample lesson plans to teachers with a list of goals, activities, and materials for teaching prosocial skills. Develop an evaluation system or checklist to make sure the initiatives are being implemented effectively. Work collaboratively with other education teams, parent organizations, and community stakeholders. Bullying can take place anywhere from the bus stop to the classroom, and schools should take precautions when identifying hot spots where bullying is more likely to occur–or is likely to go undetected due to noise or other distractions. Some common hot spots are unstructured public areas such as bathrooms, playgrounds, cafeterias, locker rooms, and hallways and extracurricular events. Train staff to take an active role in identifying and supervising hot spots to help increase safety and decrease bullying attempts. Teach students the definition of bullying and how to recognize signs of bullying behavior. 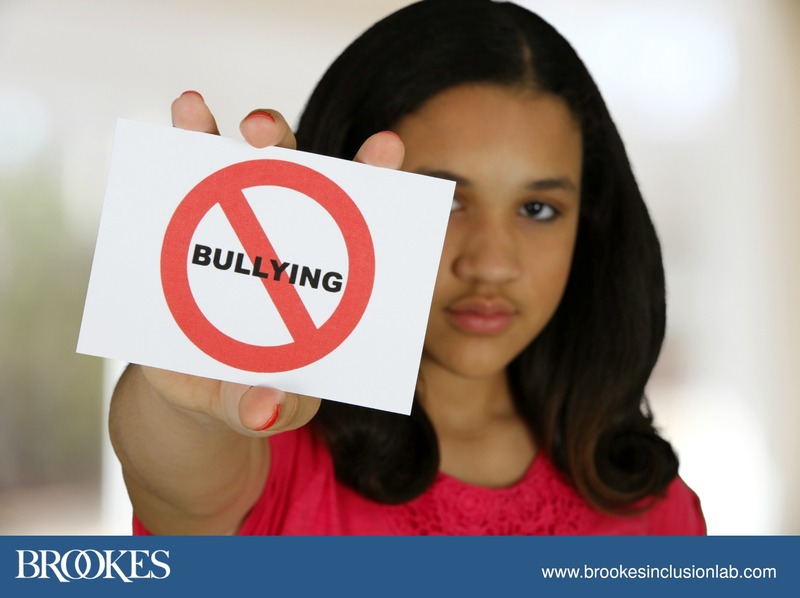 Give students specific examples to help them distinguish bullying from normal childhood conflict. Review the steps for recognizing when someone needs help, how to report bullying, and how to support the victim. Clarify the roles and responsibilities of the bystander and how they can intervene to help victims of bullying and harassment. Increase empathy by initiating cultural diversity activities and teaching tolerance. Invite guest speakers to describe personal experiences with bullying and how students can effectively intervene. Design anti-bullying instruction to address different learning styles, and be sure that students with disabilities are included in the activities. Have older students train younger students on your school’s bullying policies and procedures through active role playing and scripts. Ask students to write a “bystander quiz” that reviews the school policies, facts, and effective strategies for responding to bullying. Anonymous student surveys that cover both general questions about school climate and specific questions about bullying and harassment. Focus groups that give students and families a chance to share input regarding the school community and the effectiveness of bullying prevention techniques. A written bullying and harassment report form that gives school leaders with the relevant information to investigate and ensure necessary protections. Reach out to parents at the beginning of the school year to establish communication, share school policies, and answer questions. Offer less formal events during the year for parents to share concerns and receive information (e.g., doughnuts or breakfast with the school counselor). Use flyers, newsletters, and other communications to relay information about bullying and harassment prevention and steps parents can take to intervene. Invite parents to volunteer to read in the classroom or provide added supervision in hot spots. Create a bullying resource center for families, overseen by volunteers and family members. Invite parents as guest speakers to discuss a range of diverse topics and cultural experiences. Have parents help develop a library of children’s books that focus on diversity and fostering respect. Establish a website that includes easy-to-implement bullying prevention and SEL activities. Send letters home to parents suggesting online resources on how to help their child if they experience bullying. What strategies are you implementing–in October and all year long–to address and reduce bullying behaviors in your own classroom and school? Tell us in the comments section below! Using a simple framework of 3 Rs (Recognize, Respond, and Report), master the core components of preventing and addressing bullying and disability-based harassment at the district level, classroom level, and individual level. Read this article from Study.com for practical bullying prevention tips from 20 experts in the field.